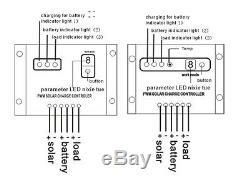 BASIC STARTER KIT - YOU WILL NEED WIRING AND YOUR OWN BRACKETS - NOTHING ELSE IS INCLUDED BUT WHAT IS SHOWN SEE WIRING HERE. 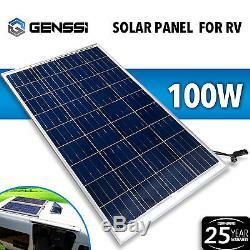 (2 Pack) 100 Watts - 12 Volts Poly-crystalline Solar Panel. Reliable - EL tested solar modules. Easy Installation - Pre-drilled holes on the back. High wind (2400Pa) and snow loads (5400Pa). 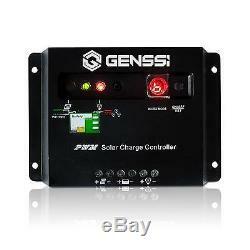 GENSSI 30 Amp PWM Solar Charge Controller. 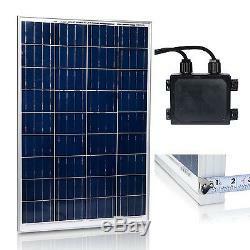 For 12V PV system: Max input 400W Solar Panel. 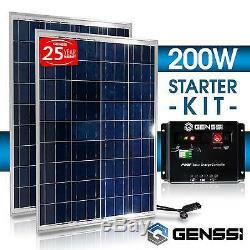 For 24V PV system: Max input 800W Solar Panel. LED indicator shows when solar is charging the battery. LED indicator shows when the system is over voltage. Four load working modes: Pure lighting control, lighting control & timing control, manual operation and debug mode. Nominal System Voltage: 12V/24V Auto recognition. 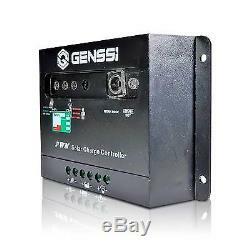 Compensation: -30mV/°C (12V), -60mV/°C (24V). Operating Temperature: -35°C to + 55°C. 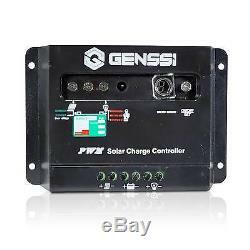 PV Input Power: 400W (12V), 800W (24V). 25% Current Overload: 1 Minute. Dimensions: 140mm x 90mm x 25mm. Efficiency - Bypass diode minimizes power drop caused by shade and ensures excellent performance in low-light environments. Emails sent late Friday or the weekend will be promptly answered Monday Morning. The item "PV SOLAR KIT 200W Watt = 2x 100W PV Solar Panel 12V RV Boat + Charge Controller" is in sale since Monday, August 15, 2016. 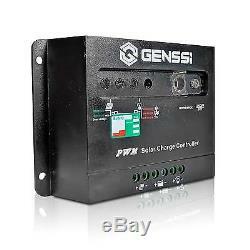 This item is in the category "Home & Garden\Home Improvement\Electrical & Solar\Alternative & Solar Energy\Solar Panels".